Our Mission is to help Ohio breast cancer patients with the day-to-day challenges of living while being treated for breast cancer. Our focus is on providing emergency living expenses. Our monies help nonprofits in your community provide emergency living expenses and other services to their clients. 100% of funds stay in Ohio. Your support provides critical services to women and men in need, including transportation to treatment, co-pays for prescriptions and doctor visits, and emergency assistance to pay for housing, utilities and food. We are a lean organization focused on our mission of helping women and men affected by breast cancer. In 2014, only 9% of our operating budget was spent on administration. 73% of our funds went directly to grants to nonprofits in your community to provide emergency assistance to breast cancer patients. 1% was devoted to helping patients and their families find local resources. The remaining 17% focused on education and community outreach. BCFOHIO DOES NOT MAKE PHONE SOLICITATION CALLS. IF YOU RECEIVE PHONE CALLS SOLICITING FUNDS PLEASE REPORT THIS IMMEDIATELY TO 216-287-0355. If you are holding a fundraiser for the Breast Cancer Fund of Ohio, let us know and we will post it on our website and Facebook page. *Visit SouthEast Harley Davidson at the Progressive International Motorcycle Show Jan 25th - 27th at the Cleveland IX Center. Buy a raffle ticket for a 2019 Street Glide, proceeds benefit BCFOhio! 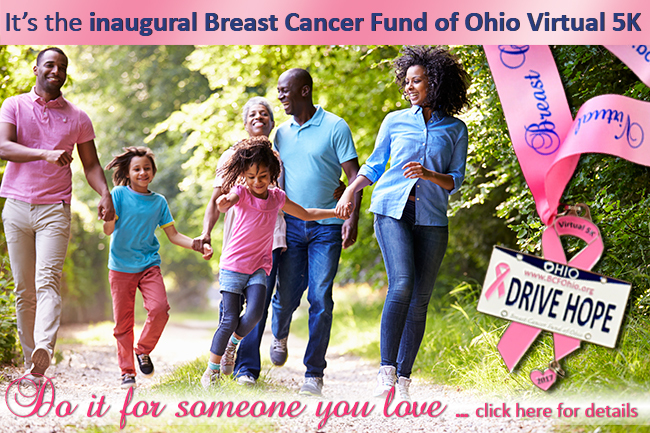 Learn more about the Breast Cancer Fund of Ohio! Read our latest Annual Report. BUY THE PLATE! The easiest way to support breast cancer patients in your community is to drive the pink ribbon plate. $25 of each plate comes to BCFOhio. No need to wait until your birthday! New in 2017! Pink ribbon plates for motorcycles! Motorcycle plates are NOW available. 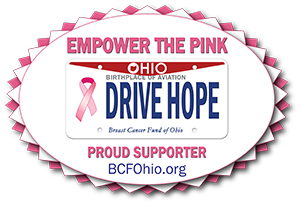 You can help women and men affected by breast cancer by supporting the Breast Cancer Fund of Ohio (BCFOhio). Remember: 100% of funds stay in Ohio! Buy the plate online or or at your local BMV office. The specialty license plate costs $35 over the regular license plate fee. Of that amount, $25 goes to BCFOhio. Join the HIGHWAY OF HOPE by donating directly. Click here for the list of those who helped us along the way in 2016.